The Banbury Cross Series was a collection of 12 volumes of books edited by Grace Rhys and published in London by Dent in the 1890s. Each book is attractively illustrated with full page and partial page pen and ink drawings in a classic Art Nouveau style by leading artists of the era. This title, Jack the Giant-Killer and Beauty & the Beast is accompanied by the sophisticated black and white open l… ine work of Bell. His drawings perfectly convey the wickedness of the giant and the gentleness and compassion of Beauty. About the Illustrator: Robert Anning Bell (1863 - 1933) was an English artist and painter. He and a group of fellow artist-craftsmen brought about the last bloom of the Pre-Raphaelite movement. As well as painting in oil and watercolour, he also worked in stained glass and mosaic. 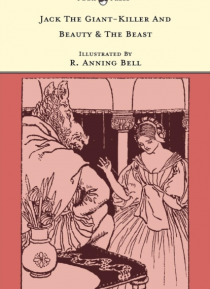 Bell's illustrations are close in style to his contemporary Charles Ricketts. Many of the earliest children's books, particularly those dating back to the 1900s and before, are now extremely scarce and increasingly expensive. Pook Press are working to republish these classic works in affordable, high quality editions, using the original text and artwork so these works can delight another generation of children.